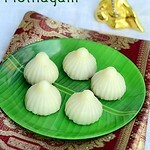 Mothagam/ Modak recipe is a must to do for Ganesh Chaturthi. 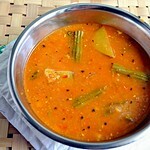 It can be prepared with chana dal pooranam or coconut pooranam. My mom makes Thengai poorna kozhukattai (coconut poornam kozhukattai) whereas my MIL makes chana dal pooranam. 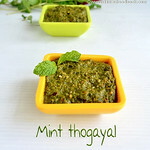 Last year during Ganesh Chaturthi, I shared an easy, coconut pooran recipe (Thengai poornam). But I love this authentic version more than the instant ones. I make coconut pooran mostly for Kerala ila ada or puran poli. 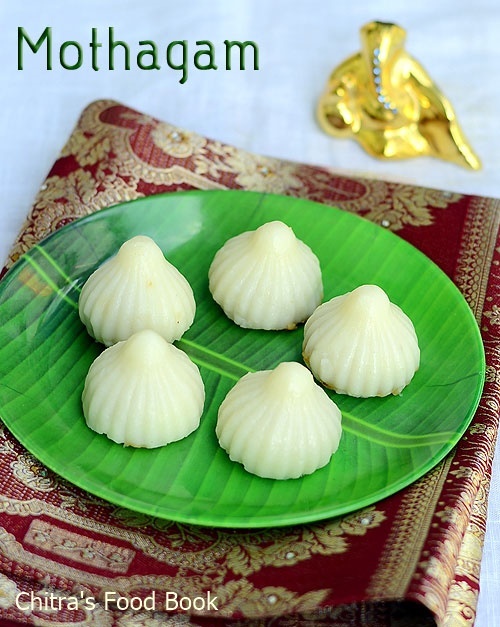 This year I wanted to make this mothagam post using thengai pooranam.Coincidentally, when I was browsing to find out the North Indian style Modak recipe also known as ukadiche modak, I found its ingredients and method of preparation are very similar to our South Indian Thengai pooranam kozhukattai. So I tried this modak recipe yesterday to share it here.It came out very well. Please click on this video link and this video link to check the dough making and for shaping the modak. Do try this easy, flavorful Mothagam recipe with coconut pooran if you are looking for a quick stuffing option.You will love it.I will try to share fried modak recipe in this week before Vinayagar Chaturthi.Lets see how to make modak with step by step picture and a video. 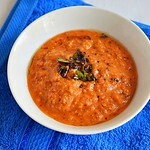 Please click THIS LINK for full Ganesh chaturthi recipes collection. 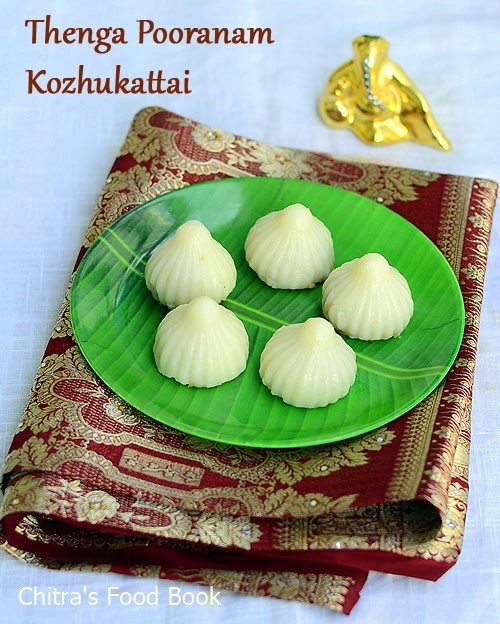 Here is the video on how to make kozhukattai dough and shaping of mothagam. How to make mothagam/Modak recipe with coconut pooran. Switch off the flame as soon as the mixture starts to leave the sides.If you stir more, pooranam will become hard and chewy.So switch off the flame at the right time. 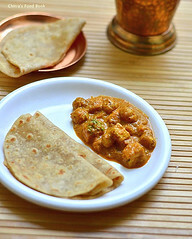 Initially pooran will look wet.But when it cools down,it will thicken and becomes non-sticky.Transfer the pooran to another plate to avoid heating up more. 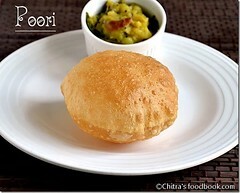 To make the kozhukattai dough,heat water adding ghee & a pinch of salt in a pan. Here I used 1.75 cups of water for store bought rice flour.But this quantity may vary.so keep some hot water ready in hand so that you can add it while making dough. When the water starts to roll boil,simmer the flame completely and add the rice flour.Mix well without lumps.Do it quickly.Rice flours absorbs all the water and becomes a thick mass.Switch off the flame. When the dough becomes warm,grease your hands with oil and knead the dough.Make it smooth without cracks and cover the dough with a wet cloth till use. Take a big gooseberry sized ball from the dough and make a cup by pressing the sides.Stuff 2 tsp of pooran inside the cup and close to make a coconut shape. Grease the idli pot and arrange the modak. You can also use a mold to make modak. 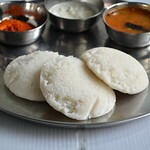 Heat water in an idli pot and when the water starts to boil vigorously,keep the idli plate and cook the modak for 7-8 minutes.Switch off the flame and let it be in the idli plate for 10 minutes before u remove the modak.When the modak turns warm,carefully remove them into a plate.Offer to God ! 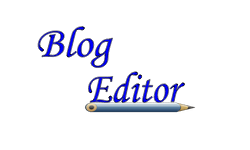 Use good quality rice flour. 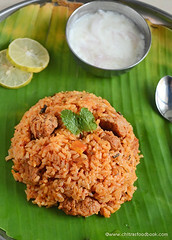 If u r planning to make by grinding rice, buy raw rice ( in Tamil nadu we call as “maavu arisi) ie. the rice used for making rice flour.Its a different quality , not the one we use for pongal.It is cheaper in cost too. Always add the required water while making the dough.If the dough becomes sticky or dry , u’ll get cracks. 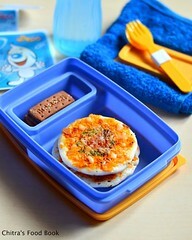 Keep the unused dough covered with a wet cloth & then with a lid while u make mothagam. Its always better to prepare the outer covering after making pooranam/ stuffing to prevent the dough sitting for long time. U can refrigerate the unused dough by keeping in an air tight box & use the next day or the same evening. Apply sesame/gingely oil in your hands every time when u make the shape. .U can identify the cooked kozhukattai by its shining look..Always remove the kozhukattai after it becomes warm.Do not remove when it is hot. 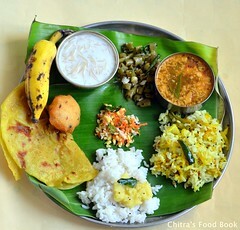 Kozhukattai may break. 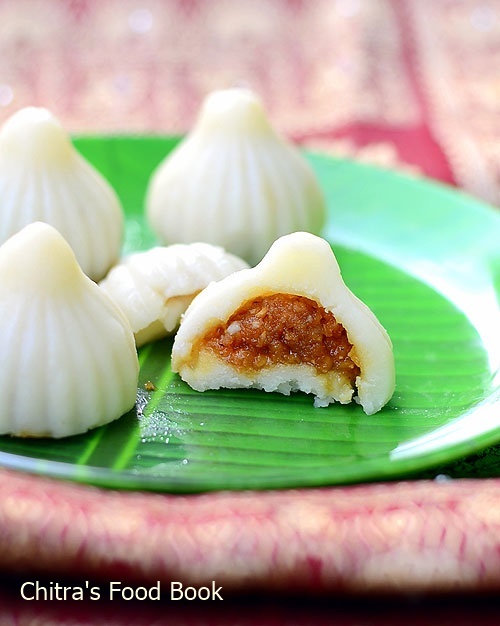 Try this easy,flavorful coconut pooran modak for this festival and enjoy ! Modhagam and its filling looks perfect and yummy. Beautiful clicks chitra.